Besides posting on wall, uploading photos and videos – you can interact further with Facebook friends by asking questions on Facebook. While Facebook Questions feature is useful for few users, other may not like it and may want to get rid of it. You can easily remove Facebook Questions from the default newsfeed using browser extensions. 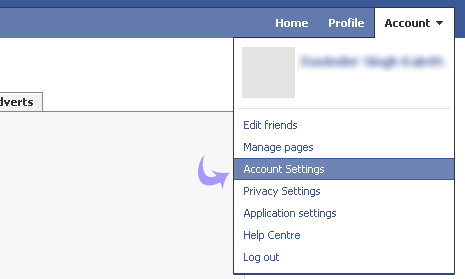 Further, you can also disable email notifications related to Facebook Questions from Account Settings as explained below. 2. Then click on Notifications tab to access options to control which notifications you receive. 3. Scroll down and look for Questions. Make sure you click to uncheck (no tick) next to options listed under Questions. This includes: Answers your question, Suggests a question for you to answer, Recommends your answer, Asks a question about you, Edits your question or answer , Comments on your answer, Comments after you on an answer and Answers a question you asked them to answer. 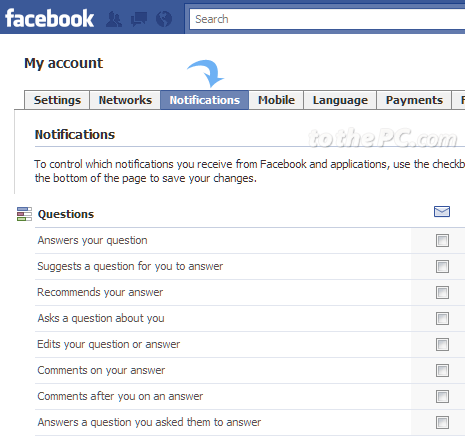 This will disable Facebook Question notifications for your Facebook account.